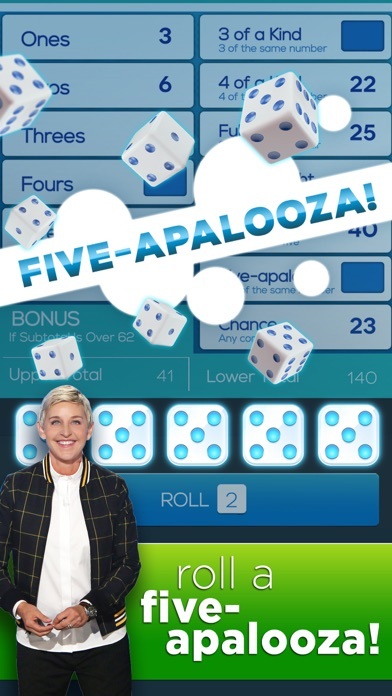 Home » Games » Dice with Ellen - A Fun New Dice Game! Made me write a review before I know if I even like it! Great app but it constantly kicks you out randomly. It’s gets super annoying. Very disappointing in comparison to Yahtzee with Buddies. 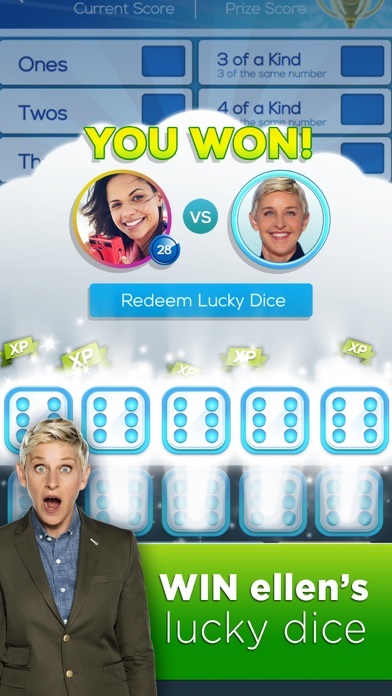 Ellen’s is boring there is one tournament style and no dice masters or fun challenges. When you do win something you win a lame scratch off ticket that you win nothing on the majority of time & otherwise may win a bonus roll. Certainly not worth spending any money on this game as you never get your money’s worth far from it. The tournament has players with astronomical totals you can only beat them by buying lots of bonus rolls. Without bonus rolls you buy (you win very few) you can’t win anything but the games against players who also didn’t spend on bonus rolls. Yahtzee with buddies is more generous, exciting and challenging. Why?!?! I want cool dice, too! I love this game. I do wish that I could get more cool and seasonal dice to make me happy! PLEASE MAKE MORE COOL DICE AVAILABLE TO THE RIFF-RAFF! Where do all the people I play get these cool dice, and WHY CANT I GET THEM, TOO?! I continually have problems with it kicking me out. And now, it kicks me out while watching a video for earning dice!! Makes me lose them quite frequently. I am so tired of losing free dice when viewing videos. Most of the time, it kicks me out just as he video is ending and I don't get credit for the dice. You have improved it by not kicking me out very often. The only complaint I have now is the scratchers. Has anyone actually won more than 5 dice? 98% of the time I get nothing. It gets to be a waste of my time to scratch them. Other than that, it is a fun game. What has happened to the new dice designs. Why are there none for holidays since last Halloween? I’m bored with the current selection. And, the scratchers have not improved at all. Update 2018: Still waiting for new dice selections!! Where are the new dice? where are the new dice Choices? Still very, very disappointed that there are no new dice to win or buy. Still waiting for new dice options! Sept 2018. Am I the only one who is not able to get new dice options? So frustrated over no new dice options. What good does it do to have diamonds when you can’t purchase new dice? Dec. 2018. Still no new dice options. 🥵 What use are diamonds if you can’t buy new dice? I have noticed other players seem to have new dice but I have not been offered new selections! What’s the deal? Feb 2019. 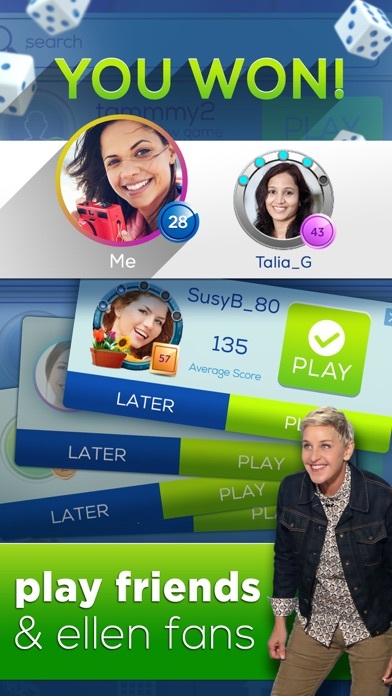 Has Ellen forgotten about this game? No new challenges or dice options. Boring!! I am totally frustrated with no new dice offered. How hard can it be to offer new designs? I love playing this game !! For the last couple of days it’s either freezing during a roll and I have to close the app and reopen it or it crashes repeatedly when I try opening it up ! Please fix this . This app crashes all the time. It takes forever to load and once it loads, then it crashes. All the dang time it crashes. Then let’s talk about the whole scratchers nonsense. 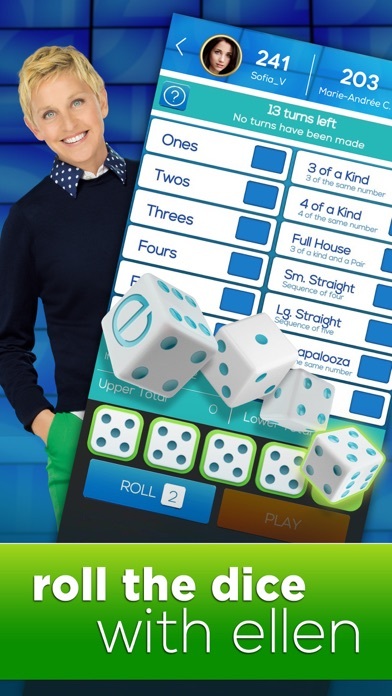 You have a better chance of winning the lottery than you have a chance of winning 5 bonus rolls on this app. Seriously. It’s freaking pathetic. Let’s focus on “Average Andy.” You will never beat him. Period the end. Leads us into, “Daily Tournament.” You are not going to beat that either. At the least, it is in the 400’s. It is some algorithm like everything else in this game that is impossible to even compete with. The point of the game, I suppose is to spend a lot of money and occasionally win a game. If you don’t want to spend a lot of money than don’t play this game. I tried this game once and left it. I am ready to leave it again. 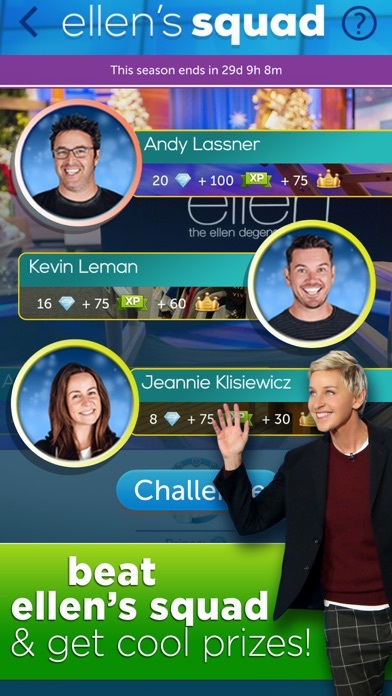 I am most disappointed that Ellen would put her name on this game with all its flaws, bogus “challenges” and the whole layout of the game.